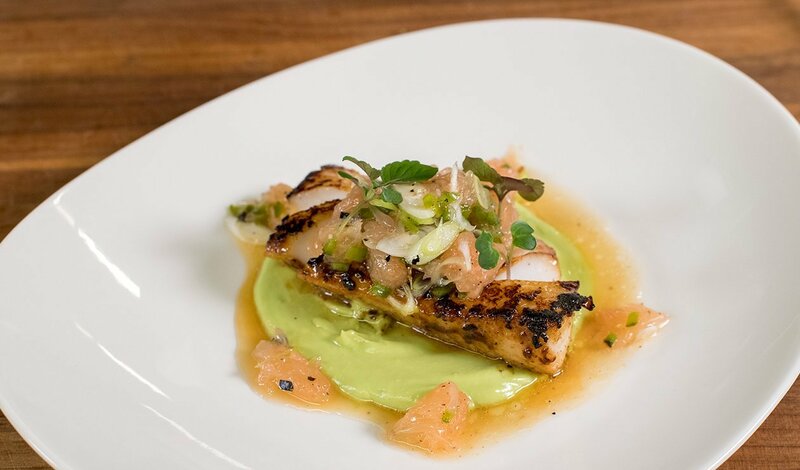 The delicate, buttery fish is marinated in sweet umami flavor, accented by the refreshing citrus relish. Char the jalapeno on a grill or over an open flame. Once cooled, seed and mince. Combine with all remaining ingredients and refrigerate until ready to use. Combine all ingredients in a food processor and blend until smooth. Keep refrigerated until ready to use. In a bowl combine all ingredients and marinate cod, refrigerated, 30 minutes. Pan sear cod until desired doneness. Serve Black Cod on top of avocado cream and top with grapefruit relish.